This rich, flavorful sausage and Gruyere grits casserole is the perfect holiday breakfast dish, as it can be made ahead and frozen or refrigerated. Simply bake “the morning of,” and serve with biscuits, fresh fruit, and hot coffee. Outstanding! Any dish that combines sausage, cheese, and grits~the perfect breakfast trifecta~is a winner in my book. This sausage & Gruyere grits casserole has all three of these rock star ingredients AND can be made ahead. What could be better than that? What I love about this casserole is its rich, complex flavor. From the spicy hot sausage to the tangy, sharp Gruyere and parmesan cheeses~this casserole has kick. Of course milder versions of both the sausage and cheeses can be substituted for those whose palates prefer less seasoning. Adjust this to suit your fancy (or to whatever you have in the fridge). Make one or two for the freezer, and when holiday breakfasts roll around, you’ll be all set! I’d love to hear from you if you make this or have any savvy recipes you’d like to share! As always, I am so grateful to you for being a reader. Be blessed, and stay savvy!!! This make ahead grits casserole with sausage is perfect for holidays, especially Christmas morning. Serve with biscuits, fruit & coffee for a scrumptious start to the day. Preheat oven to 325 degrees if you plan to serve these the same day. If making ahead, skip this part. Cook grits in 4 cups of salted water until thick. This takes about 15 to 20 minutes. SautÃ© sausage over medium heat, breaking it into small pieces. Drain sausage mixture to remove any excess fat. Add butter, egg, and Gruyere cheese to cooked grits, stirring well. Combine grits mixture with sausage mixture, stirring until well combined. 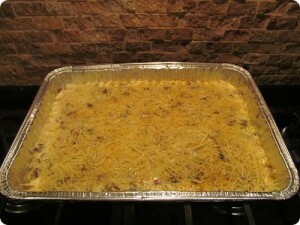 Pour into a 13 x 9-inch freezer safe casserole dish. Sprinkle with parmesan and paprika. If refrigerating, cover and keep in fridge up to two days. If freezing, wrap well and freeze up to four weeks. Thaw overnight in fridge the day before serving. 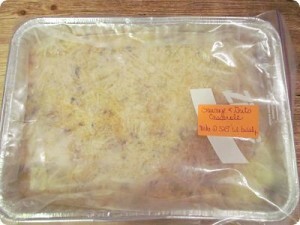 Bake at 325 degrees for 45 minutes to 1 hour, until the casserole is bubbly and lightly brown on top.